These shapes are rare. No numbered example is recorded. For no. 82, the shape book has no sketch, just the words "no.81 without a lug". Given that the lug is for holding a shaving-brush, the version without lug is presumably just an ordinary drinking mug, not for shaving. The dimensions shown don't seem to match the proportions of the sketch, however - perhaps two are transposed? Un-numbered, unmarked. Height; 8 cm. 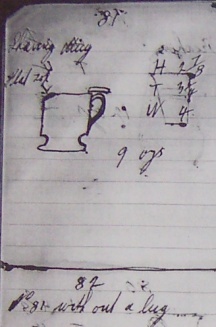 These mugs lack the shaped foot of the shape-book sketch. It is thought, however, that they could be wartime production from Premier and perhaps candidates for Later Series 82 and 81.